Fall is a perfect time of year to get those lingering home projects accomplished. Unfortunately, many remodeling projects can leave a big dent in your checkbook. You can get an auto title loan from Tio Rico, quickly and easily, in order to get started on those projects as soon as possible! 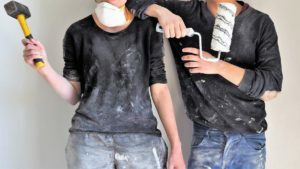 With title loans, you can get between $100-$1000 almost instantly, allowing you to tackle some of the top 5 home improvement projects under $500 this autumn. After a summer of having the kids, dogs, and guests coming and going; it’s time to pay a little attention to your carpets. Don’t neglect the stains left by food, drinks, sports equipment, mud, and more, by hiring a carpet cleaning company. Traditionally carpets are supposed to be cleaned every 12-18 months; however, most people have them cleaned every 6-8 years. For less than $.20 per sq ft, this home improvement will cost far less than $500 for the typical home. It will extend the life of the carpet while also removing allergens. Some companies will clean the carpets and the air ducts in just one trip to your house. Using a super-powered vacuum that is hooked to your intake vent, they will get everything hiding in your ducts. This is a process that can cost as little as $100- $500. Autumn days are perfect for painting the interior of your home. The winter is too cold and prevents a lack of ventilation for fumes, while summer is often too humid, increasing drying times and creating splotches. So take advantage of the dry weather to touch up those walls that have been needing a face-lift. Open up windows to ensure there is a breeze that will reduce the strong paint smell and allow the walls to dry quickly. Cleaning and repairing your home’s gutters is an inexpensive home improvement project. This seemingly insignificant project can help curb a much bigger one, as moisture accumulation can do major damage to the home. Clean your gutters, check your downspouts, to make sure water is being funneled away from the house; then repair any damaged sections so that the system is working effectively. Remember, with winter around the corner, that ice or debris can build up causing extensive damage, making now the perfect time to take care of this project. Insulating your attic can be a bit pricey. This is why taking out a title loan will help relieve the financial stress of a large ticket item, allowing you the ease to make monthly payments on the loan instead. Much like interior painting, this a good project for fall because it is not sweltering or frigid. Another benefit to insulating in the autumn is the increased ability to feel where drafts are coming in, making it easier to tell where you need to install more insulation. Making your home more efficient is the best way to save money! By caulking around doors, windows and siding, you can help keep warm air in and cold air out. Take the time and money to also update some of those older windows to energy efficient double-paned ones. Check your exterior doors to ensure that they are insulated, there are no gaps, or cracks between the doors and frames. Buy new or repair old weatherstripping around doors before the cold weather sets in to keep the cold out. No matter which projects you choose to embark on, you’ll see the benefits reflected in your energy bills and the appearance of your home. Taking the time to improve your surroundings is a simple way to improve your life. Call Tio Rico today and let us help get you started.